The Despicable Me duology, one of the best non-Pixar animated series to reach the silver screen in recent years, was successful with kids and adults for different reasons. Older viewers appreciated its tongue-in-cheek wit and satirical aspects. Children, on the other hands, flocked to theaters for one reason: Minions. The cute yellow creatures were everywhere: Happy Meal toys, stickers, video games, stuffed animals, sheets, etc. 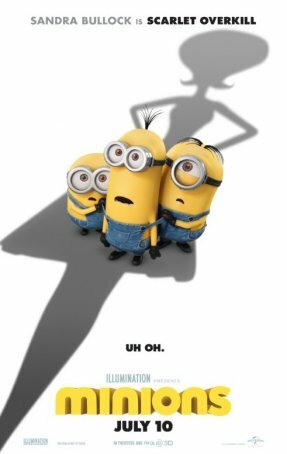 The Minions are a marketing goldmine so it's no surprise they now have their own movie. Equally, it's no surprise that Minions is pitched almost exclusively to the under-9 crowd. This is a family picture in name only. It's a kids' film that adults will be able to tolerate. Random innuendos and pop references (Richard Nixon, The Beatles) represent the pinnacle of "mature" content. Minions fails to engage older viewers on the level achieved by the concurrent Inside Out. But children will love it because they adore the Minions. There isn't much of a story. The narrative, such as it is, exists as an excuse to get Minions on the screen for 90 minutes. It's occasionally amusing but, considering how funny Despicable Me and Despicable Me 2 were, comically disappointing. Many of the jokes are either obvious or have been exposed through pre-release marketing material. I kept waiting for the clever or insightful moment that never arrives. The bar is set pretty low for Minions. The film opens with an extended prologue illustrating how the Minions have existed since prehistoric times, repeatedly attaching themselves to the biggest Bad Dude around. These sequences are entertaining but, because they form the backbone of one of the trailers, there's nothing new here. The story gets underway in 1968 with three Minions - Kevin, Bob, and Stuart (all voiced by Pierre Coffin) - headed to Orlando for "Villain-Con" where they hope to attach themselves to the gloriously evil Scarlett Overkill (Sandra Bullock) as her new henchmen. Mission accomplished, they accompany Scarlett and her husband, Herb (Jon Hamm), to London where she plans to steal the Crown Jewels and depose Queen Elizabeth. In that caper, however, the Minions prove to be more of an impediment than an asset and their unhelpful actions soon earn Scarlett's wrath. Minions is replete with missed opportunities. The prologue could have shown additional instances of Minion mishaps fouling up history. "Villain-con", a riff on Comic-con, is neutered satirically. A ripe chance to parody giant monster movies is mostly bypassed. There are times when Kevin, Bob, and Stuart are more annoying than appealing (their inability to speak English isn't an asset). The ending is silly and nonsensical - not that anyone should expect a glorified cartoon to be coherent. By this point, the producers, pandering to their young target audience, give up any attempt to be intelligible. The cast features some recognizable names but expert performances camouflage familiar voices. Sandra Bullock embraces the bold, over-the-top essence of her character. No one would identify Jon Hamm or Michael Keaton unless informed beforehand of their participation. Steve Carell's cameo is welcome but he speaks only a few lines. As a narrator, Geoffrey Rush may lack the gravitas of Morgan Freeman, but he's fine for the material. The animation is generic 2015 computer-generated material. There's nothing eye-popping or groundbreaking here. Unlike Inside Out, which tries some interesting techniques, Minions sticks to a tried-and-true approach. The 3-D is lackluster. Oddly, the best usage of 3-D occurs during the post-credits sequence, making one wonder why the filmmakers couldn't have done better with the film as a whole. Theoretically, Minions will vie with Inside Out for the same audience (both, after all, are animated), but the reality may be different. Nuanced and magical, the latter film has a broad enough appeal to enchant viewers of all ages. Inconsistent and undisciplined, Minions is more an adjunct to marketing than a legitimate motion picture. Adults without kids may be momentarily diverted, but no more. Parents will get more pleasure out of their children's reactions than from the film itself.